The Bukhara Deer Action Plan is the main tool for conservation activities under the MoU. The plan provides for the restoration of the range and number of the Bukhara Deer in suitable habitats, the development of a transboundary network of protected areas, legal protection measures and enhanced international cooperation. The MoU provides an intergovernmental framework for governments, scientists and other groups to monitor and coordinate ongoing conservation efforts. The WWF Central Asia Programme is carrying out a programme to support all existing natural populations of Bukhara Deer and three projects to reintroduce the Bukhara Deer in its historical habitats of Uzbekistan and Kazakhstan. Work has also begun to restore Bukhara Deer habitats in Tigrovaja balka, Tajikistan, with funding from the Disney Wildlife Conservation Fund. Those efforts came about due to the interest and activity of the Cervid Taxon Advisory Group (TAG) of the Association of Zoos and Aquariums (AZA) and the Minnesota Zoo in particular. A plan to develop a system of protected areas got its start with the Econet Central Asia project. The project is a joint effort of the United Nations Environmental Programme, Global Environment Facility (GEF) and WWF. Much more work and funding is however still needed to develop a transboundary network of protected areas in riparian forests and to repair environmental degradation along several rivers in Central Asia. 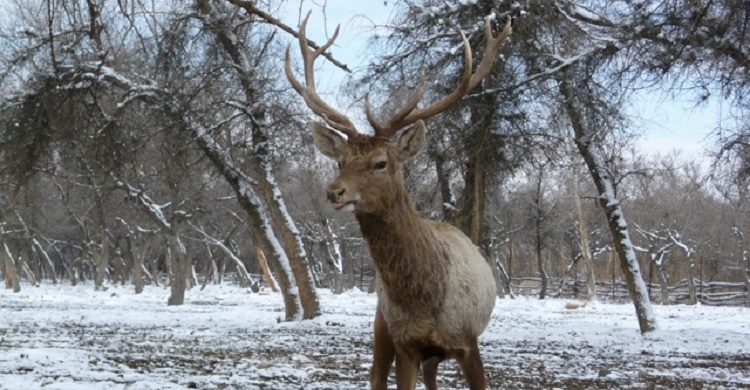 Nonetheless, the coordinated, systematic efforts of governments and non-governmental groups to save the Bukhara Deer have already started showing significant results. The populations in all range countries have stabilized, and have even begun to grow. The global population of this rare deer is now estimated at about 950 animals versus 350-450 a few years ago. And many people living in Central Asia now recognize the Bukhara Deer as a national treasure of global importance.